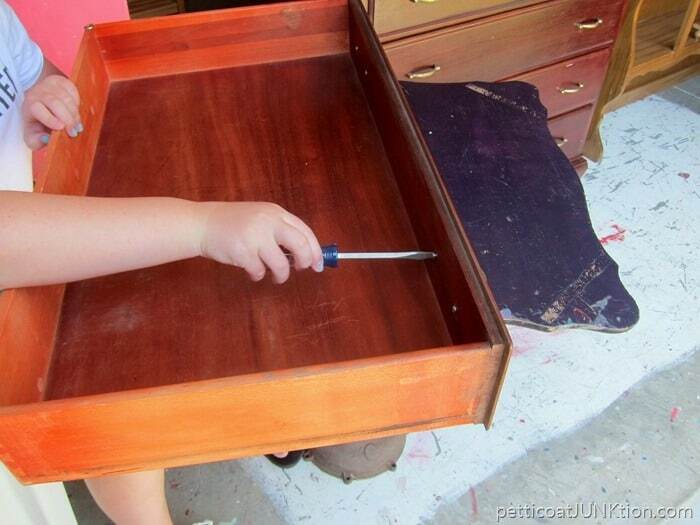 My granddaughter is going to show you how she did her bedroom furniture makeover. She did a great job. I’m impressed. I think she takes after her grandmother (insert Kathy smiley face). 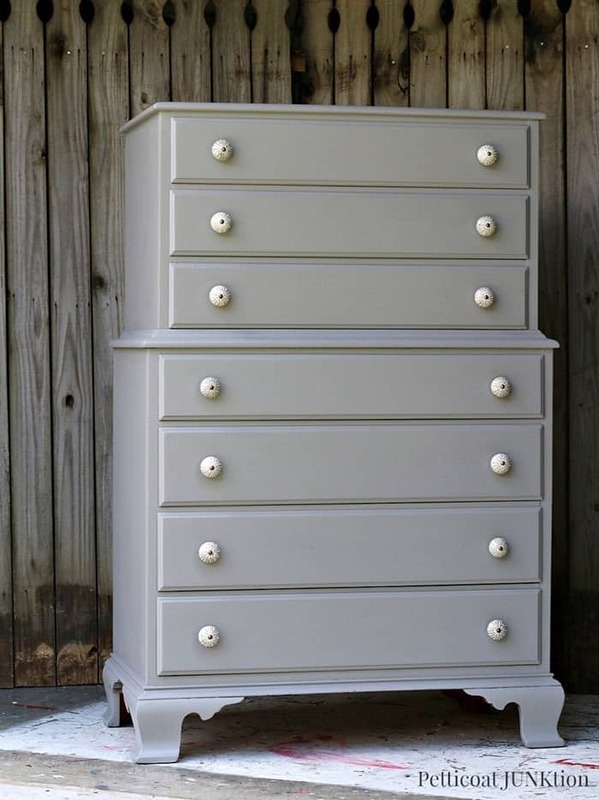 You guys may remember an earlier post about Tenley painting a chest of drawers for her bedroom. Tenley is the oldest granddaughter (12) and she spent some time with us this Summer. She started back to school yesterday. Seems like Summer break went awful fast. When I was in school, many moons ago, we got out of school for at least three months and our break went until after Labor Day. 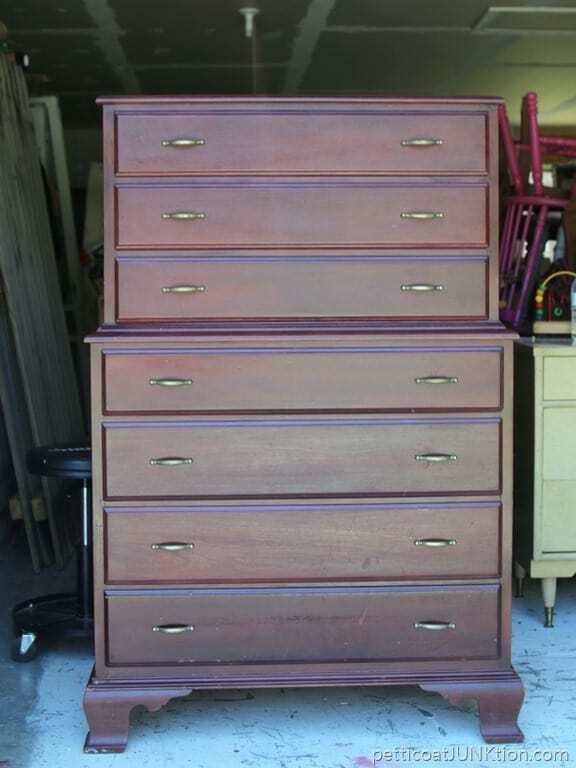 This is the chest Tenley picked out to replace a smaller piece in her bedroom. I really like the chest on chest look. Tenley has great taste. Solid wood furniture is hard to come by these days. That’s why I prefer older pieces. 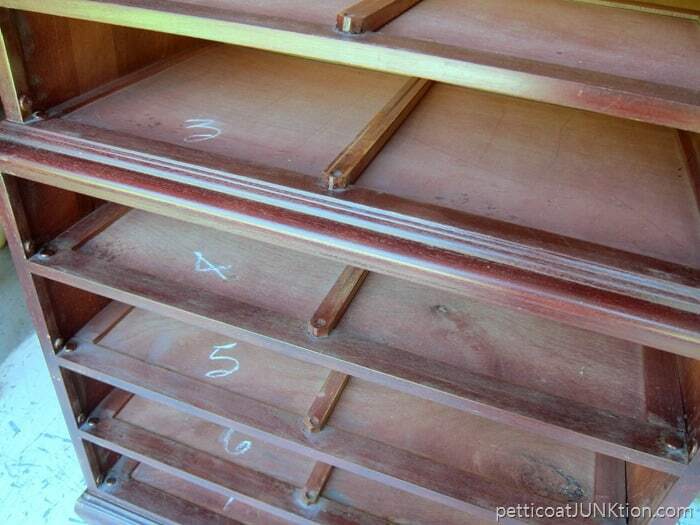 Tenley cleaned the chest and numbered the back of the drawers so we could put them back in the same spot. She removed all of the original hardware. We wanted to replace the pulls with knobs so we had to fill one screw hole on each side of the drawer. We opted to fill the inner holes and use the outer ones for the new knobs. 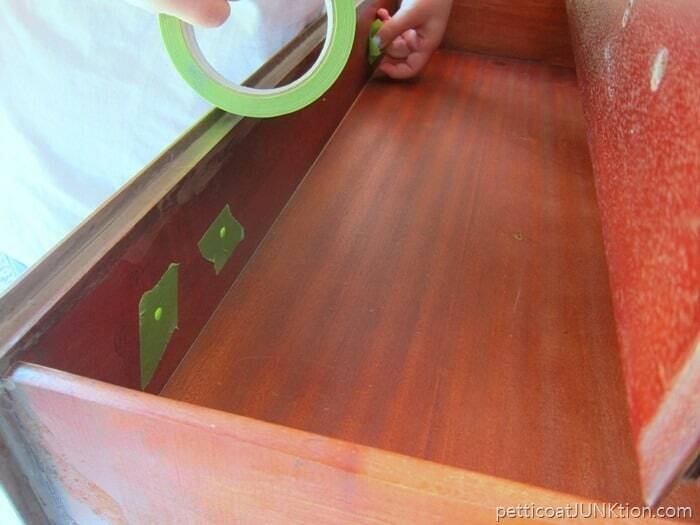 I always tape over the screw holes on the back of the drawer fronts to keep paint or wood filler from leaking into the drawer. Tenley and I filled the holes with wood putty and sanded the filler smooth when dry. 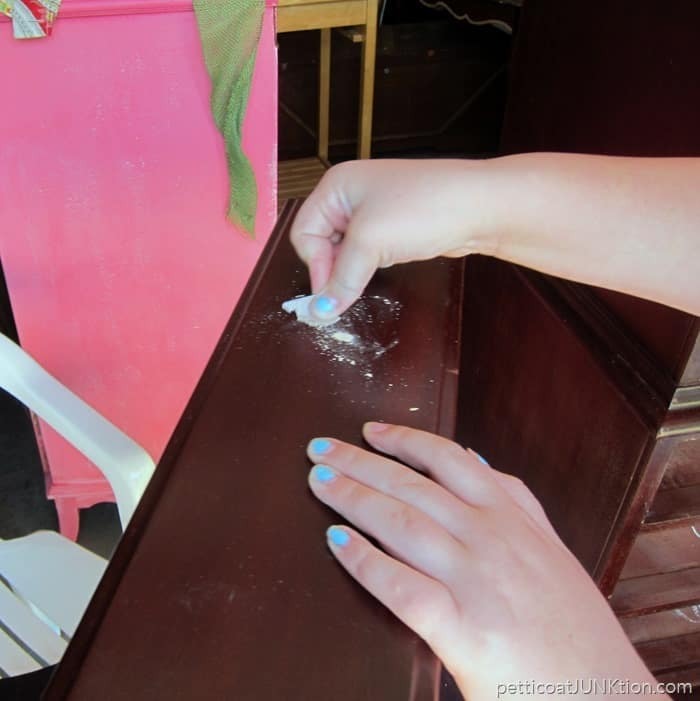 I have another complete tutorial on replacing furniture hardware here….How To Replace Furniture Hardware. We used Glidden Gripper primer tinted gray for the base coat. I was afraid the red tone of the original finish would bleed through the paint but it didn’t. Yea! It was so hot this Summer we kept putting off the makeover. Finally we just bit the bullet and went for it. Tenley was anxious to get it finished before school started back. I helped her with the makeover but she did most of the work. She did a great job too. Must take after her grandmother. We applied the primer one day and the latex paint the next day. The paint color she selected was a soft gray. It was just a little lighter than the primer. One coat of paint was all that was needed. 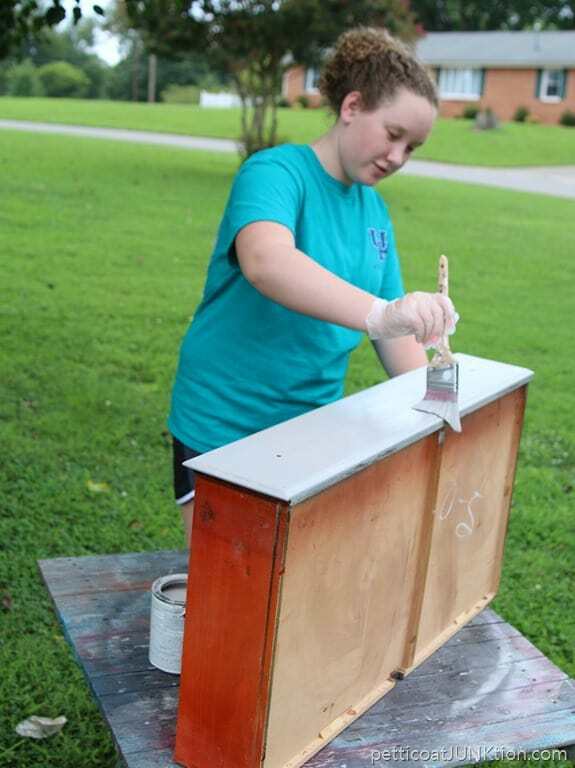 By the time the project was finished Tenley was almost a pro. Tenley picked out the pretty knobs at Hobby Lobby (50% off). I admit to being a little skeptical about her choice. But it’s her furniture and I let her pick out everything. As you can see she made a good choice. 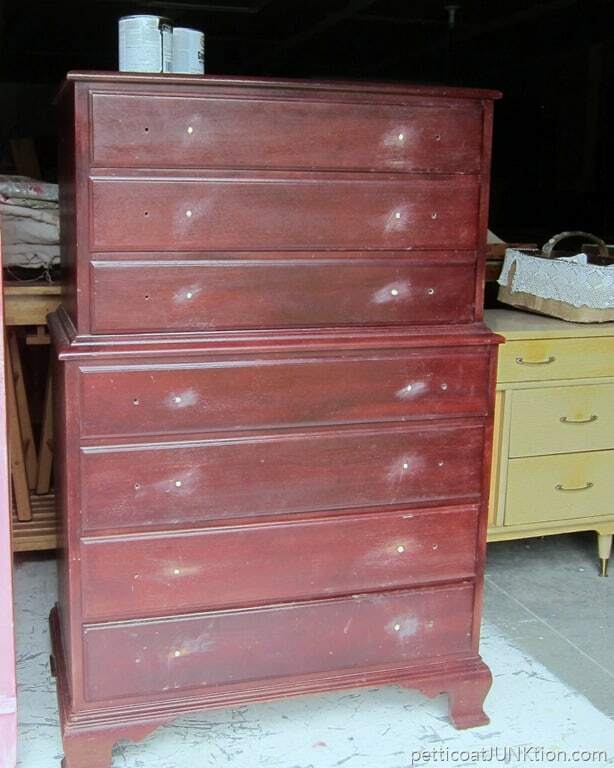 The chest of drawers is very classy looking. What do you think? My girl did a good job didn’t she. 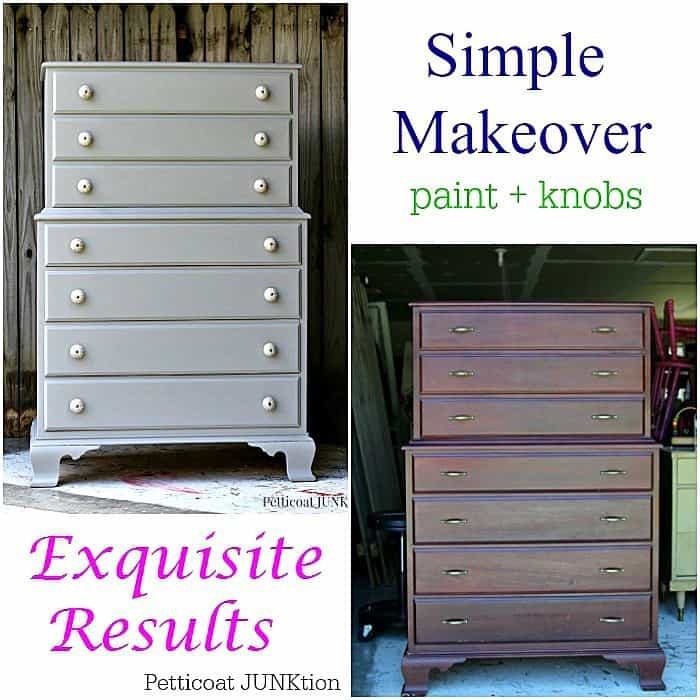 Bedroom Furniture Makeover – What a difference paint and knobs make. 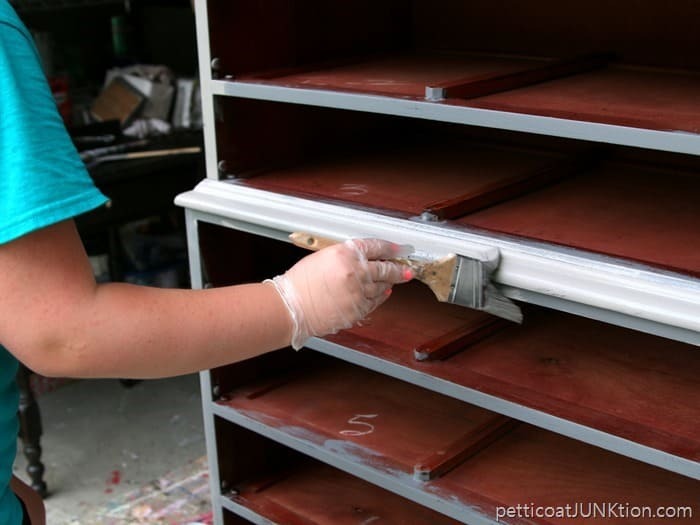 Do you want to try your hand at painting furniture but you are afraid? Embrace the Fear and give it a try. I wrote a post just for you. 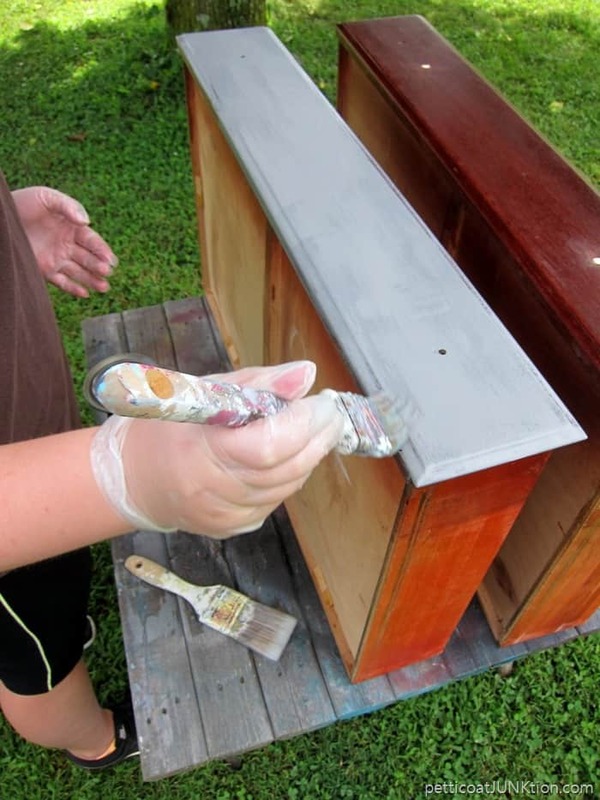 click here…….Painting Furniture Guide 101 For Beginners. 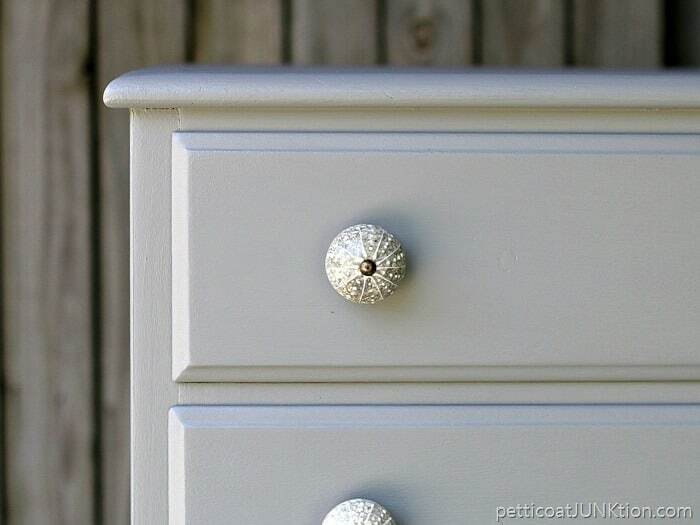 The dresser turned out beautiful, and I love the knobs! Great job! She did an amazing job! Love the finished dresser. What a great piece and nice grey too. Thanks for linking up to Merry Monday! 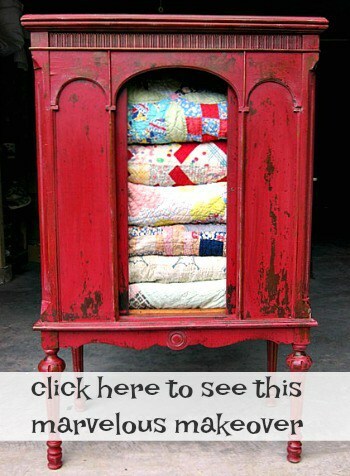 Sharing on G+! Have a great week! Beautiful makeover! And I love that you and your granddaughter did it together. Very sweet. Loved the pictures. 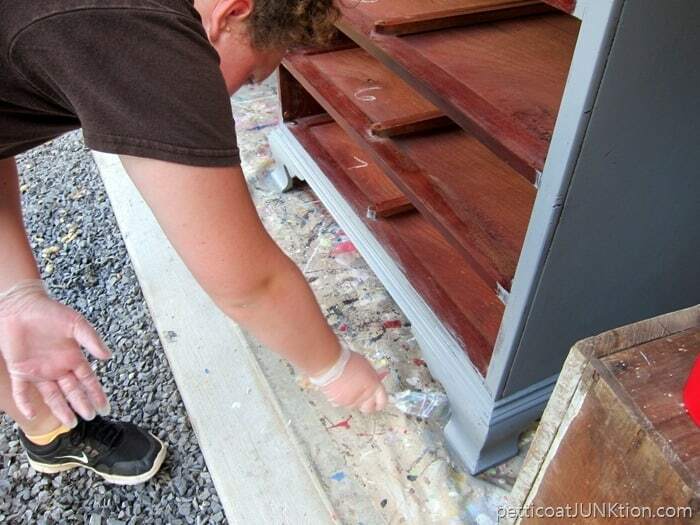 Cathy on one of your other painting projects, you added a bonding agent to your paint for durability. I’ve never heard of this. What exactly is a bonding agent and which one did you use. 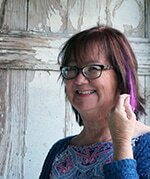 Kathy, she did a great job! ? She did a fantastic job, painting the dresser! Talent runs in your family! I love this! So sweet. Beautiful……she did a great job! The chest on chest looks awesome. Lovely color. Nice job Tenley. Beautiful! Looks like you have a protege! Great furniture and great colour choice. Tenley has talent and a talented grandmother. What a lovely job! Congrats!!! 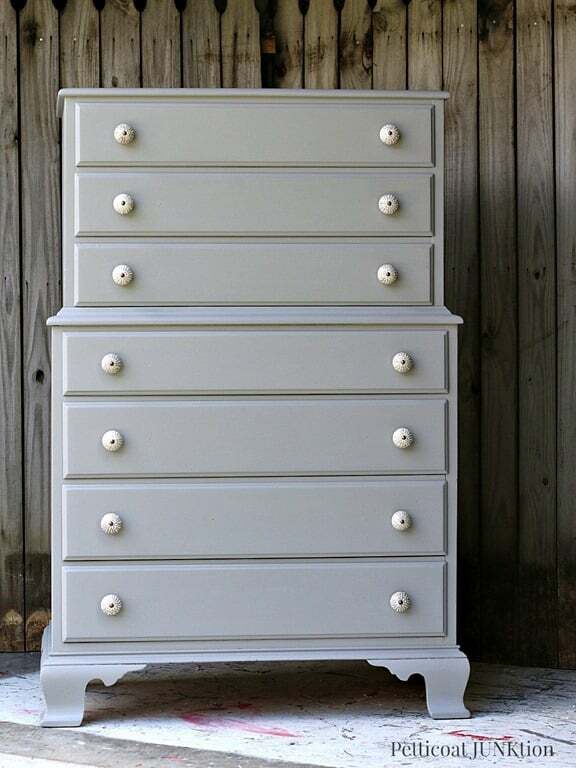 Kathy, it is gorgeous in the soft gray and those knobs are perfect! Tenley might be your future apprentice, she’s a natural! Great job Tenley! Obviously the apple has fallen right next to the tree! Thank you Jennifer. She loves to get creative! It’s awesome, she did a great job! Great job! What color paint did you use? I really like it. I’ll email you Rhea and maybe we can figure it out! Tenley did such a good job. She is also very pretty. It’s great that she is taking an interest in such things. Please tell her “great job” for me. One of my favorite colors! Great job!